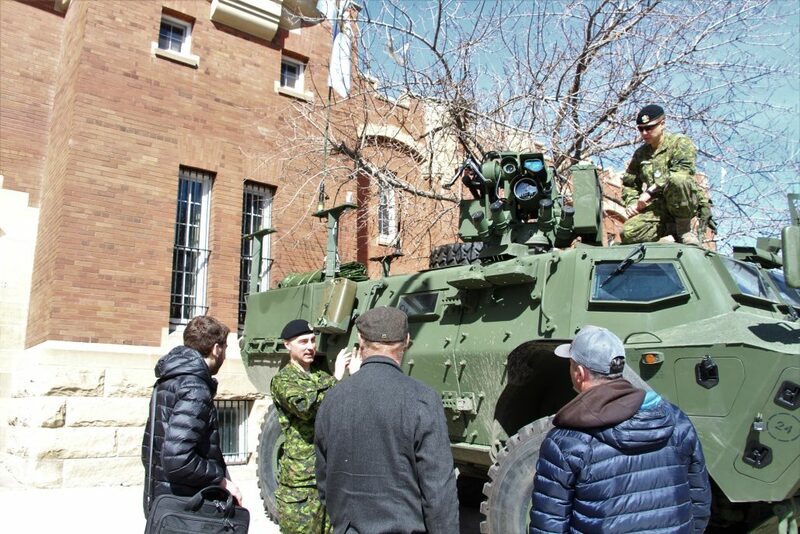 The Regiment has officially unveiled the new Tactical Armoured Patrol Vehicle (TAPV) during the annual celebrations of St. George’s Day. 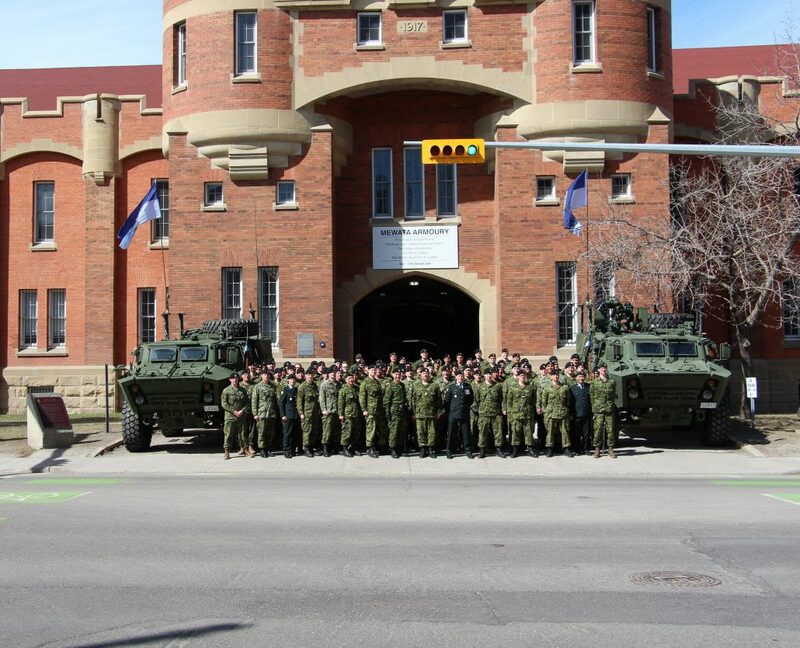 The regiment currently has 3 Tactical Armoured Patrol Vehicles in Calgary. The regiment expects to obtain another TAPV in the near future. In total, the King’s Own Calgary Regiment will have a total of 4 Tactical Armoured Patrol Vehicles. 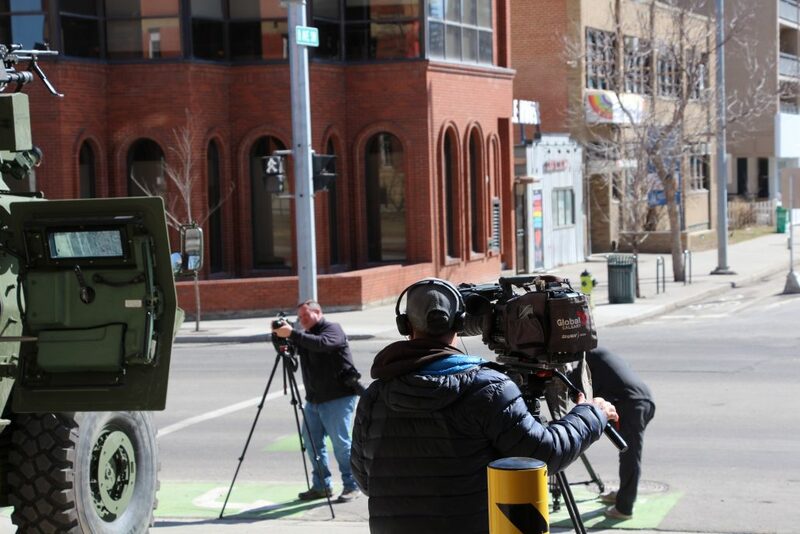 There will be 2 utility variants and 2 equipped with the Dual Remote Weapon System (DRWS) stationed in Calgary. The DRWS TAPVs can be equipped with a 40mm H&K Grenade Machine Gun or the M2HB 12.7mm Heavy Machine Gun and a Coaxially mounted C6 7.62mm General Purpose Machine Gun. The vehicle also possesses smoke grenade launchers on the remote weapon system turret. The vehicle will compliment the current regimental training and operations of Armoured Reconnaissance. The regiment has been employing its senior soldiers in getting qualified on TAPV driving courses and TAPV Gunnery Courses at various Canadian Forces Bases around Canada, including Canadian Forces Base Wainwright and Gagetown, in order to start training the other soldiers of the regiment. The Tactical Armoured Patrol Vehicle is powered by a Cummins QSL diesel engine, which provides 365 horsepower and around 1100 lb-ft of torque. Although weighing a massive 18,462 kg with armour, the vehicle can easily attain its maximum speed of 110 km/h and has maximum range of 644 km (400 miles). The vehicle utilizes an independent suspension axle system and it has a central tire inflation system to prevent flat tires during combat operations. The TAPV relies upon composite armour to provide the maximum protection to the vehicles occupants. The armour is slated as being 20% better than the armour on the M1117. The TAPV also has a V-shaped hull, which provides protection against mine and improvised explosive device (IED) blasts. The vehicle also has a high ground clearance, which increases protection from mine and IED blasts. It can withstand up to 10 kg of explosive force directly under its hull, and can resist even 12.7 mm armour-piercing rounds. Each of the seats in the vehicle are blast protected, and the vehicle has vented wheel wells to disperse the energy of an explosion out from the vehicle.